Puppy Playpen Guide – How to Buy Good Playpen for Your Puppy? Puppy playpen is a safe playground for your dog – where your puppy can play and stay safe. Let me help you choose the best playpen for your beautiful puppy. The Midwest Puppy Playpen shown above is the best metal puppy playpen at a super affordable price. It has 1000’s of happy owners. The comparison table below will show you the other options you’ve highlighting their main features. Then, I will cover each playpen in detail, also comparing their pros and cons. A great playpen means a great experience for your puppy. When your puppy grows up with that great experience they become great dogs. So as the great saying goes: “Behind Every Successful Dog Lies A Great Playpen”. You know I made this up for you, right. But definitely there is some truth behind it. So choosing and buying a good puppy playpen is important for house training a dog successfully. With this little note, let’s dive in to the detailed reviews below. 2) How to set-up a puppy playpen? Midwest Puppy Playpen lets your pet have some fun in a safe and secure manner. It not only keeps him/her contained in a specific area but at the same time provides enough room to run, jump, roll over and basically do whatever the pet likes to do while playing. One of the simplest playpens available in the market today, this Midwest playpen for dogs has the quickest assembly time. It comes in 5 different sizes for dogs of varying breeds and ages, with and without the door option. You can choose your playpen according to your specific requirements. So, let us first look at the various sizes available and then explore the common features of this Midwest exercise pen. + Budget friendly – Since the Midwest exercise pen is made of metal it might scratch your floor especially if it has some sharp edges or protruding parts. – No locking mechanism for the angles between the panels. Consequently, your pets might be able to change the shape by pushing at it. 24”H– Each panel of the playpen measures 24 inch in height and width. It is ideal for dogs weighing up to 25 pounds and having a height up to 16”. It will include dog breeds like Terrier, Chihuahua and some spaniel breeds. 30”H– The panels of the playpen measure 30 inch in height and 24 inch in width. Hence, it is suitable for dog breeds like Spaniels, Beagle and Collie that weigh up to 40 pounds and have heights up to 20”. 36”H– Each panel of this playpen measures 36 inch in height and 24 inch in width. It is good for dogs weighing up to 70 pounds and having a height up to 23” like Boxers, Retrievers and Dalmatians. 42”H– The panels of the playpen are 42 inch in height and 24 inch in width. It is ideal for dog breeds like Akita, Foxhound and Bullmastiff that weigh up to 90 pounds and have heights up to 26”. 48”H– Each panel of the playpen measures 48 inch in height and 24 inch in width. It is suitable for dogs weighing up to 110 pounds and having a height up to 30”. It will include dog breeds like Doberman, Ridgeback and Saint Bernard. You can select the Midwest puppy playpen that matches your dog’s size and weight and buy accordingly. The Midwest puppy playpen also comes with a door option. Sometimes, reaching inside the playpen requires bending or climbing over, which might prove cumbersome even with the smallest size playpen. In such cases it will be wise to choose the playpen with the door option. This also helps if you are setting up the playpen permanently, in which case shifting the panels to just get inside does not look like a very reasonable solution. The following features of the Midwest puppy playpen makes it stand out from the other playpens available in the market today. The Midwest exercise pen comes assembled in a collapsible form. There are 8 interconnected panels which you will simply need to unfold and clip together. The pen is open ended which means it can be either stretched out like a fence or joined using the clips to make an enclosed area. Since the setting up does not require any tools at all, you will be able to do it within seconds. The product comes with 8 ground stakes which you can use to secure the panels while using the playpen outdoors. Once erected the Midwest puppy playpen will give you an area of 16 square foot. You can erect the playpen in an octagon shape, square shape or rectangular shape. This versatility helps you to put the playpen anywhere in your house or even outdoor depending upon the available space. This adaptability also helps to fit it in specific nooks and corners of the house or room. You can even erect it as a single file and use it as a temporary fence. Some customers have even used it to fence off certain furniture and even parts of their house. This is especially helpful during the teething stage of your puppy when he will like to chew at anything and everything. You can use the Midwest exercise pen for animals other than dogs, like rabbits, tortoises, cats, ducks and other small pets. The playpen is made from durable metal wire, and hence it is very sturdy. You can use the ground stakes to make it more secure outdoors. A dog will not be able to jump over it if you pair it with the right size playpen. 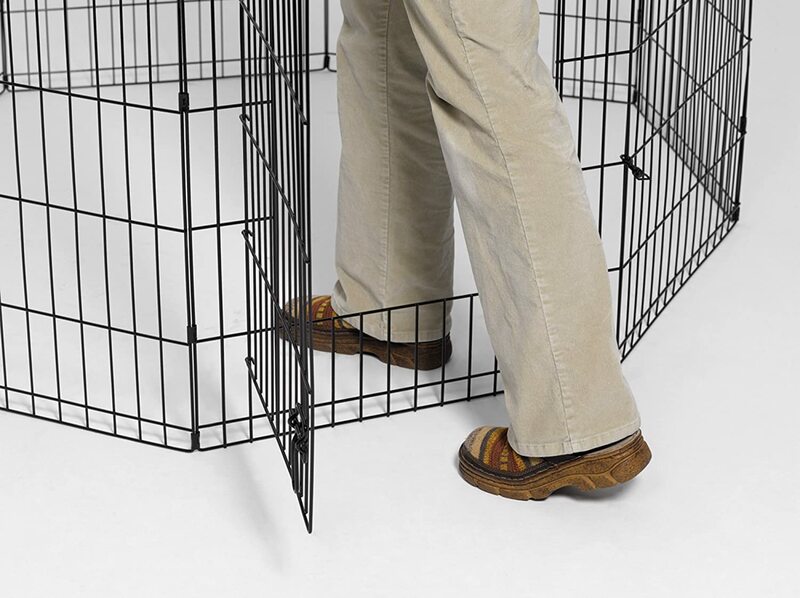 The Midwest exercise pen is fold-able which makes it easy to store or carry with you. You can take it with you while travelling and set it up again easily. This Midwest playpen for dogs has an electro coat finish which prevents rusting. Therefore, you can use it outdoors without worrying about corrosion. Comes in 5 sizes (height wise), with 8 panels. Each panel’s width is 24”. Total space provided is 16 square foot. 8 ground stakes and 4 thumb-snaps included for easy assembly. The weight of the Midwest puppy playpen is around 30 lbs which makes it possible to carry it along while travelling. 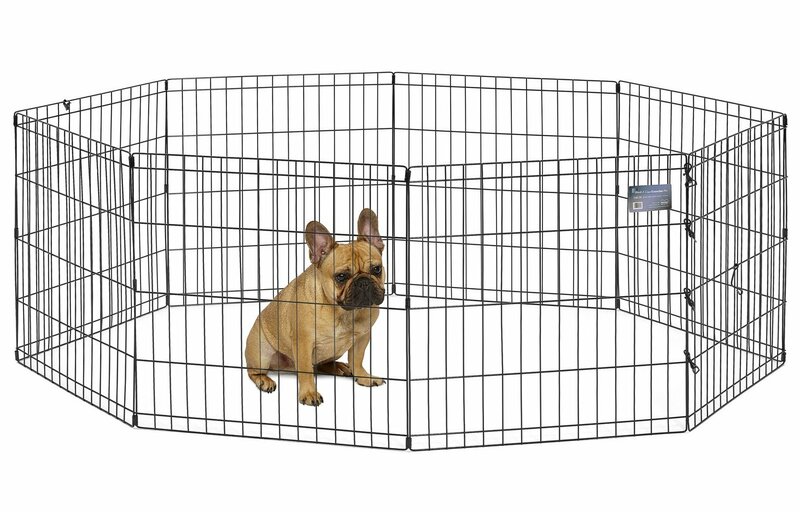 You can also connect the playpen to a crate or kennel. Additionally, you can add a sunscreen top for extra safety and comfort. The playpen comes with one year manufacturer’s warranty. What current buyers are saying? Most buyers of the Midwest puppy playpen are very satisfied with the purchase. They are happy that their pets now have enough enclosed space to play around safely, whether indoors or outdoors. The easy assembly, portability and shape customization add to the delight of buyers. Since the playpen is quite spacious it does not give the feeling of being caged and does not make the pets anxious. Few customers have reported that the shape of the playpen gets distorted when their dogs push it around. This might be more of a training issue then a product defect. Some customers have also found that the playpen is not suitable for certain type of flooring. Hence, as a workaround they use vinyl floors underneath the playpen. Overall, this Midwest playpen for dogs has been able to safely contain many pets of various sizes in a fun and enjoyable way. The Midwest puppy playpen is one of the most reliable and economical playpens that fit pets of various sizes, breeds and ages. I have already reviewed IRIS 24” 4-Panel Pet Playpen with Door here. It is a good playpen for your puppy and I highly recommend it. Parkland pet portable foldable playpen is a soft yet sturdy tent like playpen that provides enough space for your pets to romp around. Since it is fold-able, it is a perfect travelling companion. After folding, it will not take up much storage space also. You can even take it for hiking and camping because it very lightweight. The playpen is ideal for various small pets and gives them a safe and secure environment to play when their pet parents can’t give them their 100% attention. The Parkland pet portable foldable playpen comes in the following 3 sizes to accommodate different size animals. Small: The small playpen has dimensions 17”X29”X29” and it weighs just around 2 lbs. This playpen is ideal for cats, rabbits and toy and small breeds of dogs like a Maltese. Medium: The medium size playpen measures 24”X36”X36” and it also weighs about 2lbs. This playpen is suitable for medium size dogs like boxers and Dalmatians. Large: This is the biggest size playpen in the parkland series. The dimensions of this playpen are 24”X48”X48”. The weight of the playpen is 3.85 lbs. This playpen will fit a Ridgeback comfortably. The Parkland pet portable foldable playpen comes pre-assembled and you will hardly take any time to install it. It pops up like a tent once you open the package. Moreover, it has an inner metal frame which provides stability to the whole structure. There are two zip openings, one at the top and one at the front. You can use the top for putting things inside and your pet can use the front opening (door) for easy entry and exit. The top opening is completely removable and you can also strap back the front opening with Velcro straps. You can always roll back the front door and strap it to give the playpen a den like look. Your dog will definitely love this easy accessibility. The playpen is also very easy to clean. You no longer have to worry about it becoming dirty when you set it up in a garden or any such place. You can clean it with a wet or damp cloth or even with baby wipes. Some customers even clean it with a hose and then put it out to dry. The Parkland pet portable foldable playpen is very light weight and fold-able. Once you fold it, it will take up very less storage space. Hence, you can easily carry it along while travelling. Since you can set it up quickly and even use it outdoors, you can easily take it with you for your hiking and camping trip. The durability and sturdiness of the material ensures that the playpen will be able to withstand the vigor of such outdoor activities. Since the playpen is made of a soft fabric it is very comfortable for all pets, unlike metal playpens which might cause injury to unsuspecting pups and kittens. It has a soft bottom which adds to the comfort level of the pets. You can always place your pet’s favorite blanket at the bottom to make it more comfy. The zippered top helps you to place such mats or blankets easily without having to crawl inside the playpen to do so. You will also appreciate the fact that the bottom is sewn to the playpen. This will help keep the mats/blankets safely and securely inside. The mesh at the top and sides not only make the playpen airy they also provide your pet an unrestricted view of the surroundings. Though the Parkland pet portable foldable playpen is made of cloth like material it is very sturdy and durable. The mesh on the top and sides is not any thin netting but is made of a thick rubber-like material. Pets will have a hard time chewing through it. The playpen is manufactured by Parkland Pet in China. It is made from high quality oxford coated 600D material. The assembly of the playpen does not require any tools. It comes in three different sizes for pets of different size and weight. It is ideal for indoor as well as outdoor use. Most of the buyers of Parkland pet portable foldable playpen find the playpen very useful for indoor and outdoor play. They are happy that the soft fabric of the playpen prevents any injuries to their small pets. They especially like the top cover as it makes it easy for them to take their pets outdoors, without any fear of birds or other animals. There have been complaints by some pet owners about the playpen not holding well against their energetic and active pups. Well, this is a common problem with all fabric playpens. They will not be able to survive the onslaughts of a very active pup that is looking for a way to escape. 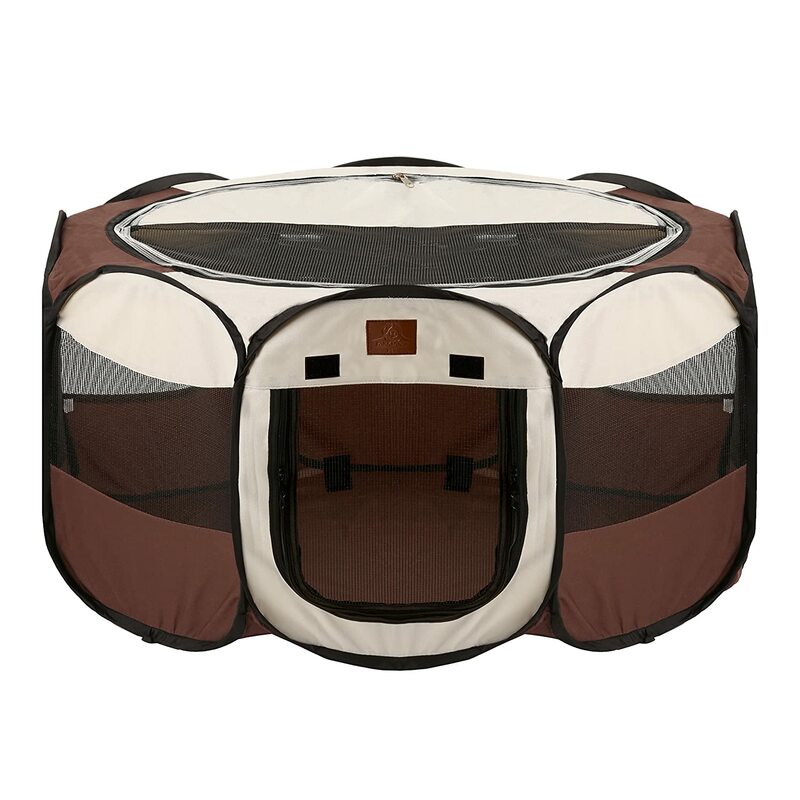 Overall, the Parkland pet portable foldable playpen is a highly comfortable playpen that gives enough space to pets to play around, indoors or outdoors. Esk collection playpen is a fabric playpen that can safely hold small to medium size dogs and other small pets. The fabric provides the much needed softness for small animals that you will not find in other metal or wooden playpens. There is no danger of your pets getting their paws stuck or getting injured by any sharp edges. Not only this, the playpen is also easy to assemble, lightweight and portable. What’s more it comes very competitively priced! With so many features all rolled up in one, let us find out if this playpen by Esk collection is really value for money or not. Esk collection playpen has the following features that make it stand apart from the playpens available in the market today. The playpen, once fully erected, provides 48” diameter of ground space. This space is enough to house pups of various breeds like Rottweiler, Pitbull or Labrador. The only restraining factor will be the height of the playpen which is only 24”. Hence, once the pups of the larger breed of dogs grow, you will have to find a replacement playpen. Otherwise it is comfortable enough for small breed of dogs like Chihuahua or even a litter of pups or kittens. There is sufficient space to even keep their beds, toys, feeding bowls inside. The most important feature that makes it score over metal playpens is the comfort level it provides. It is soft-sided hence your dog can run, walk, roll over or even jump around without any fear of injury. It has a soft bottom which is removable. You can remove it for cleaning or when you want to put the playpen outside. The Esk collection playpen has a mesh top and two mesh doors. This not only ensures easy accessibility for you and your pet but also increases visibility. You can easily keep an eye on your pet, and your pet is also able to see his surroundings and does not feel isolated. You can zip down the top and put mats or blankets or feeding bowls without having to go inside the playpen or worrying about your pet escaping. The two doors provide easy entry and exit for the pets. The whole playpen is very easy to assemble and can be done within seconds. You can also take it down fairly quickly and fold it for easy storage. It does not occupy much storage space also. There is an accompanying carry bag with handles that makes it possible for you to carry it along with you when you are travelling. When you want to put the playpen outside on the ground you can remove the bottom and secure the playpen with ground stakes. There are loops in the playpen which you can use for the stakes. This provides additional stability to the playpen. As mentioned previously, the bottom of the playpen is detachable and hence you can take it out for cleaning. The playpen is also very airy with the meshes hence it does not let any smell to build up inside. The Esk collection playpen comes in three different colors; blue, pink and black. You can choose a color that suits your pet’s personality. The black colour will hide dirt better and is a good option if you intend to use the playpen mostly outdoors. If you believe in gender specific colors then you can choose blue or pink according to your pet’s gender. This is something you will not find in many playpens. The Esk collection playpen has extra storage pockets on the outside to keep things like toys and treats and it even has a water bottle compartment. All this proves extremely convenient and saves time. It also helps to keep the inside of the playpen clutter free and organised. Beautiful and attractive design There are some complaints regarding the quality of the zippers. But if used gently they tend to last quite long as reported by a few customers. Airy and easy to clean Not suitable for very energetic dogs looking for a way to escape. With repeated attempts, they will be able to tear apart the fabric and mesh. Waterproof 600D oxford cloth material used for the playpen. The top and bottom have zips for easy opening and closing. The playpen has an 8 panel design. 100% warranty is given by the manufacturers. Most buyers are satisfied with their purchase. They recommend it for small pets who will not try to scratch or tear their way out. Some buyers have reported problems with the zipper but if used gently, it will definitely last longer. The Esk collection playpen is certainly value for money if you are buying it for your small well trained pet. Its various features will add to the enjoyment and comfort of your pet whereas at the same time allowing you to work peacefully without any worries. Are you looking for innovative indoor puppy pen ideas to entice your newest member of the family? Or are you feeling a little stressed because you don’t know how to set up a puppy playpen in the first place? Well, you no longer need to worry because we will be soon listing down some indoor puppy pen ideas that will help you to set a secure, enclosed play area for your cute little fur ball. How to set up a puppy playpen? So, how to set up a puppy playpen that will not only fulfill all the basic needs of the pup (like food, water, sleeping shelter) but will also be attractive enough for the pup to want to stay in it. We have listed the steps of setting up a playpen that will be functional as well as comfortable enough to keep your puppy inside for long hours and also out of harm’s way. Visibility: If you keep the playpen in an area where the pup cannot see anyone, then he will obviously not want to go inside it. Try to select a location where he can see other members of the household frequently. Some indoor puppy pen ideas include setting up the playpen in the living room or even in the kitchen. This way you will also be able to keep an eye on him while doing your household chores. Spacious: Another important point to consider is space. Since you will be putting in things like sleeping mat/crate, food and water bowl and a few toys in the playpen, you will need sufficient amount of space for setting up the playpen. Try to find out a place where you will want your pup to use it on a long term basis. So, think about the size he will grow as a dog and the space he will require as an adult dog. Outside view: Next is the view. Your pup should be able have an outside view too to keep things interesting. Hence placing the pen near a window or a balcony would be an excellent indoor puppy pen idea. Sunlight: Make sure that the playpen also receives some sunlight during the day. Since sunlight is important for proper growth and development of the pup hence, keeping his playpen in a sunny spot is one of the best indoor puppy pen ideas. But ensure that you can pull shades/curtains around the playpen to avoid too much direct sunlight. Comfortable room temperature: Ensure that the playpen is not very near to the A/C or the radiator. The surrounding temperature should be comfortable for your pup to play happily. There are many things to look for in a playpen before finalizing your purchase. Material: Playpens come in a variety of materials like fabric, plastic, metal and even wood. Look into the pros and cons of each one of them, and buy one that will suit your needs. Take into account factors like weight, comfort, safety (no sharp edges), locking mechanism and durability while choosing a playpen. Some playpens can be structured into various shapes and can also be used as a fence for outdoor use. Some indoor puppy pen ideas include setting up rectangular, square or octagon structures for optimum utilization of the available space in a room. Size: Most playpens come in various sizes to suit different breeds of dogs. At the time of selecting a playpen look at the weight and size recommendations carefully. Sometimes, though the weight requirements match your dog’s weight, the size does not. Make sure to choose a height that will prevent your pup to jump over the playpen. Portable: Though most of the time you will be using the playpen indoors, you might want to consider buying playpens that you can use outdoors as well. A lightweight playpen that folds quickly will be easily portable. Installation ease: These days you get preassembled playpens that do not require any tools for setting them up. You can install them in minutes or even seconds. A crate or sleeping pad: This can include a crate with a towel or blanket inside. Try to make his sleeping area as comfortable as you can so that he does not get attracted to your couch or bed when he is outside the playpen. Try to keep the crate at one corner so that it does not come in between your pup’s free play area. 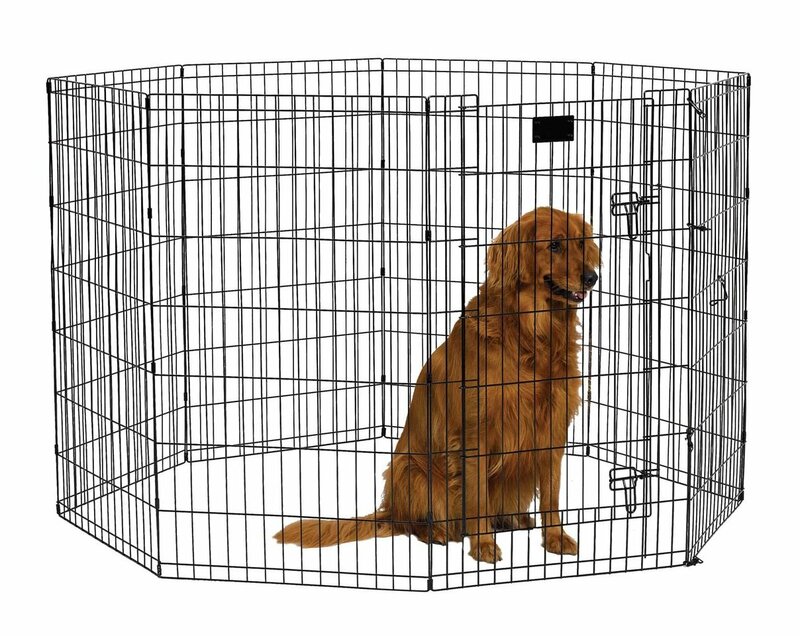 Keep the crate door open so that your pet can come and go as he wishes. 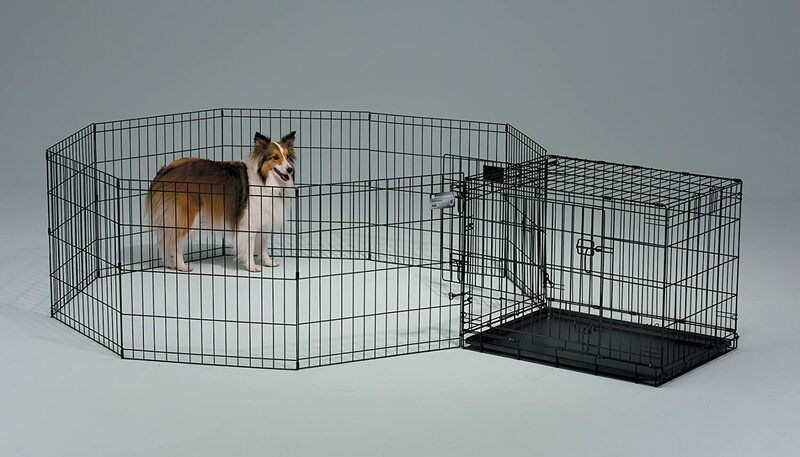 Remember to tie the door with the panel of the playpen so that your pup doesn’t close the door of the crate by chance. He might also get scared by the loud noise of the crate door closing. You can also keep 1-2 toys inside the crate to familiarize him with his sleeping pad. Water bowl: The water bowl should be spill proof and unbreakable. You can even keep it chained tightly to a bar of the playpen to prevent your pup from overturning it. Food bowl: If you plan to leave your pup inside the playpen for extended hours then keep a food bowl inside with his food in it. You can also use food delivery toys to provide food to your pup. It will make him learn to work for food. Toilet area: This will contain some puppy training pads where your pup can go and relieve himself. You can also keep some synthetic grass on top of the pads to create a prototype of the area where your pup will do his toilet outdoors. Make sure the synthetic grass is easy to clean and dry. Ideally the toilet area should be at another corner of the playpen, far from his sleeping and play area. Chew toys: These are favorites of all pups as they like to chew on things. This also helps them during the teething stage. Food delivery toys: Kong toys or Starmark’s bob-a-lot are treat dispensing toys that can be filled with your pup’s food which he can eat at a leisurely pace. Colorful toys, Rubber squeaky toys and soft toys: These toys will help stimulate the various senses of your pup like sight, sound and touch. Snuggle puppy toy: These are special type of soft toys that help to comfort a pup when he is feeling lonely or stressed. They have a heat source and real feel heartbeat that helps to calm your pup. You can keep them inside the crate to help your pup sleep better. Puzzle toys: Toys like Seek-a-treat make a pet think in different ways. Something to tear: Since pups like tearing a lot you can fulfill this instinct by giving them an egg carton or a newspaper. This time though you can be sure that the mess will be contained in the playpen only. Toys are important as they prevent your pup from getting bored and will motivate him to stay inside the playpen more. Give at least 4-6 toys daily. Rotate them every day to keep up the curiosity and interest level of your pup. Just make sure that your pup plays with a new toy under your supervision at first. This is to ensure that the toy is fully safe to leave your pup alone with it. Safety should be your primary goal while setting up the playpen. Make sure the playpen does not have any sharp edges. Sit inside the playpen and try and find the places where your pup can get his paw or head stuck. If you find the space between the panel bars too wide then cover it with a net. If you find that the playpen design has some gaps (like in a picket fence design), then fill those gaps. Your pup can get his paws stuck accidentally in those gaps. Use zip ties to secure connectors of the panels. Hopefully, the article was able to answer your question on How to set up a puppy playpen sufficiently. In case you have any further queries regarding indoor puppy pen ideas then please let us know. We will try to answer them as comprehensively as possible. Till then Happy Puppy Parenting!